The season of Lent is a very solemn time for Christians all over the world. Through Lenten rituals, they relive the passion, death and resurrection of Jesus Christ. Christians believe Him to be the Son of God, the Messiah of His people. The teachings of Jesus center on loving God above all else and loving one's neighbor. But at the end of the Lenten season is a joyous event, Easter. This is the day that the Lord Jesus is resurrected from the dead. It is a renewal of sorts, a rebirth for all Christians. Easter is highly anticipated by both Christian adults and children, alike for different reasons, of course. Lent is a 40-day period; it is a time for introspection, reflection and penance for different denominations of the Christian faith. The 40 days represent the days that Jesus spent in the wilderness before He began his ministry. During the 40 days He spent alone, Jesus was tempted several times by the devil. He surpassed his temptations and went on to minister to His flock. Ash Wednesday signals the start of Lent. The day before this is known as Fat Tuesday or Mardi Gras, the last day for fun and feasting before the 40-day period of fasting and abstinence. On Ash Wednesday, Christians are expected to fast (lessen their food intake) and abstain from meat. This is also expected during Good Fridays. Some practice fasting on each Friday of Lent, too. There are exceptions usually related to the age and/or the health condition of the person. Holy Week starts on Palm Sunday, the commemoration of Jesus' jubilant entrance into Jerusalem, where he was welcomed with palm branches by the people. Holy or Maundy Thursday commemorates the Last Supper. This was the time when Jesus washed the feet of His disciples and shared his last meal with them. Jesus instituted not only the first mass during Holy Thursday but also the first priests (His apostles) and the Sacrament of Holy Communion. Every Good Friday, Christians relive the trial, crucifixion and death of Jesus Christ. Black or Holy Saturday is a day of mourning and anticipation for the eventual resurrection of Christ. An Easter Vigil mass is held at night. Easter Sunday is the day of Christ's resurrection. As foretold by the prophet Isaiah, the Messiah, Jesus Christ, will conquer death on the third day of his passing. Aside from religious rituals there are many fun events that children actively look forward to and participate in during Easter. Mardi Gras is a big celebration in Brazil and in other countries as well like Italy and Germany. In the U.S. state of New Orleans, Mardi Gras is a most anticipated event. Carnival celebrations that involve parades, dancing, singing and feasting are common during this time. On Ash Wednesday, Christians flock to churches to receive ashes in the form of a cross on their foreheads. The ashes usually come from burned palm branches used during the previous year's Palm Sunday. Ash Wednesday is supposed to remind the faithful of their sinfulness and to repent during the season of Lent. Triduum Sacrum, Paschal Triduum, Holy Triduum or Easter Triduum refer to the last 3 days of the Holy Week. It begins on the evening of Holy Thursday, which serves as the vigil for Good Friday. The triduum ends on the night of Resurrection Sunday. Also known as Sacred Triduum, different rituals and religious activities mark these three sacred days. Crucifixion comes from the Latin word "crux" which means cross. Romans used this method of punishment during Jesus' time. Nails were driven into His wrists and feet as He was positioned on a wooden cross. But Jesus' legs were not broken, as was customary during crucifixions. as a replacement for the feast of the pagan fertility goddess Ishtar, whose feast also took place sometime around the start of spring. Spring has always been regarded by many cultures as a time of renewal, a sort of rebirth after the months of winter. Rabbits and eggs are both symbols of fertility. They have been linked to spring time and thus, to rebirth, even before the Christians established Easter. The egg in particular symbolizes rebirth in many cultures including the Egyptians, Persians, Greeks and Romans. White lilies, symbols of purity, grace, hope and life also symbolize Easter. Some sources say that the word Easter comes from the name "Eastre." She was an Anglo-Saxon goddess who represented the hare and also the egg. 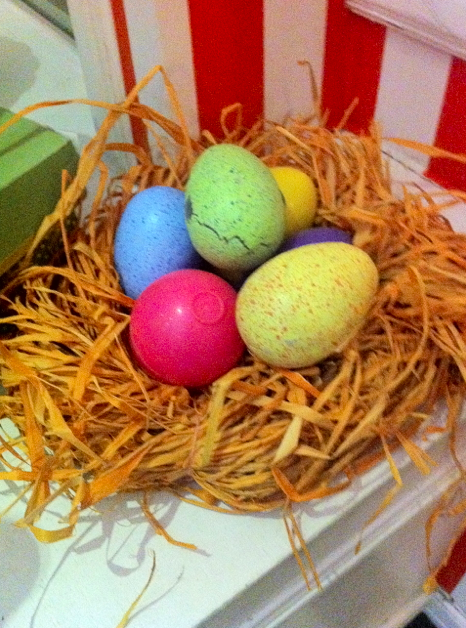 In France, Easter is called "Paques" while in Spain it is called "Pascua." 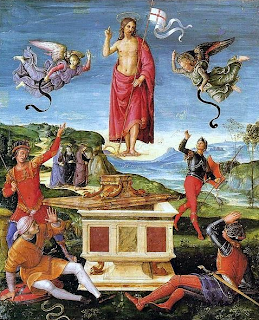 Both terms are derived from the Greek and Latin term for Passover: "Pascha" or "Pasch." In Hebrew, Passover is "Pesach." More than 90 million chocolate bunnies are manufactured every year. The chocolates ears are often the first to go. Pink jellybeans are a favorite treat during this time. Candy companies consider Easter time as the 2nd biggest payday for them, Halloween being the first. In 1878, US President Rutherford B. Hayes started a tradition to mark Easter Sunday that continues on to this day. The annual Easter Egg Roll is held on the front lawn of the White House. This year, President Obama and his family will play host to the 134th Easter Egg Roll on April 9, 2012. An expected 35,000 people will be attending this fun event. Children paint Easter eggs and engage in Easter egg hunts and other fun activities. In 2007, almost 10,000 children went looking for 501,00 eggs in an Easter Egg Hunt down in Winter Haven, Florida. The Guinness Book of World Records listed this as the worlds largest Easter egg hunt to date. On Easter, Pope Benedict the XVI will give his Urbi et Orbi (for the city of Rome and for the world). It is a blessing not just for the people of Rome; it is a blessing for all Catholics around the world. Apart from Easter Sunday, the Pope also gives his Urbi et Orbi during Christmas Day and other important days. Easter Monday, also referred to as "Renewal Monday" or "Bright Monday" is observed in some countries, territories and states. Australia, Canada, Germany, Italy and New Zealand are just some of the countries where Easter Monday is an official holiday. The season of Lent reminds Christians to show humility and gratitude because the Son of God and their Savior, Jesus Christ, died for their sins. Learning to forgive others and to love those who are especially difficult to love are also important lessons during Lent. For true believers of Jesus, humility, gratitude, the ability to forgive wholeheartedly and of course to love for God and neighbor should go beyond Lent.